This delightfully fresh, fruity and easy-to-prepare recipe is a perfect summer entree. - Combine yellow pepper onion, peaches, pears, cranberries, and lemon and lime juice into large mixing bowl. - Mix in honey and chopped mint. Season with salt and pepper to taste. Let stand 30-40 minutes. Toss every 10 minutes. - Brush duck breasts with honey and season with salt and pepper. - Grill on medium-high heat for about 4-6 minutes per side for medium rare. Remove from grill and let rest about 3 minutes. 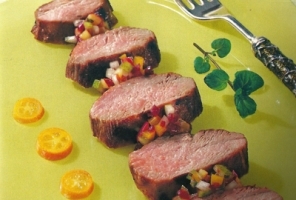 - Slice duck breast and place on dish with dollop of salsa in between each slice.